MDR-800 Size: 32 fl. oz. In this age of multi-tasking, MDR’s “NEW” Safe-N-Clean cleans and deodorizes the bilge, BUT, more importantly, it makes dangerous gas or diesel fuel spills “SAFE” for removal. Safe-N-Clean encapsulates the fuel molecules and that mixture is dispersed into the bilge water. Any fuel vapors in the bilge are instantaneously suppressed to below their combustible limits. The treated bilge water also accelerates the biodegradability of the spilled petroleum products much faster than if left untreated. Safe-N-Clean will keep the area sparkling clean, odor free and make a potentially dangerous condition “Safe”. Developed almost 30 years ago to remove oxidation, tarnish and damaging corrosion from boat hardware easily and effectively. Simple to use…apply paste formula with a very fine bronze wool and rub lightly, wait a few minutes, wash off with fresh water and wipe dry. For further protection, use MDR Metal Wax. SS-125 Size: 16 fl. oz. The latest in water based stainless steel cleaners! Amazon’s will not yellow or stain and is odorless, making it great for galleys and appliances, hardware, ladders, etc. Easy wipe-on, buff-off for quick removal of fingerprints, watermarks, grease and grime. Leaves a beautiful finish and a coating of protection to keep stainless looking great. WATCH RUST DISAPPEAR when applied to rusted areas. 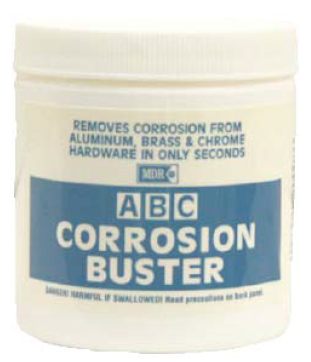 Removes rust stains from most surfaces including fiberglass. Gel formula can be applied to vertical surfaces. Restores rusted tools and equipment. When rust is gone, metal surface is sufficiently etched for painting. No scraping or wire brushing. MDR-635 Size: 16 fl. oz. Easily removes brown/orange waterline stains caused by tannic acid, iron, lime deposits, etc. found in salt and fresh water. Heavy-duty formula will not harm fiberglass, yet cleans when other cleaners will not. Easy to use… spray on, agitate, and rinse off. MDR-732 Size: 16 fl. oz. Formulated to clean and polish clear plastic windshields, flybridge enclosures, hatches, instruments and equipment, etc. PLASTI CLEAR prevents build-up and repels the attraction of airborne dust and dirt and provides an invisible protective barrier. PLASTI CLEAR also has anti-fog properties to keep a clear view on deck and flybridge clear vinyl enclosures in high humidity areas. MDR-746 Size: 16 fl. oz. HEAVY-DUTY FORMULA REMOVES GRIME, GREASE AND DIRT QUICKLY AND EFFECTIVELY FROM DOCKSIDE SHORE POWER CABLES. Easy way to clean dirty dockside power cables. Simply apply small amount on a wet scrub brush…agitate on grimiest cable and within minutes your cable will look like new. MDR-748 Size: 16 fl. oz. Simple to use… just wet your fender with water, apply a small amount of Fender Cleaner, agitate slightly, and effectively flush away the grime. Super-strength concentrated formula developed for hard-to-clean surfaces. Quickly removes grease, grime, oil and dirt without hard work. Easy to use… just wet surface with freshwater, squirt on Krazy Clean sparingly and brush off grime instantly. 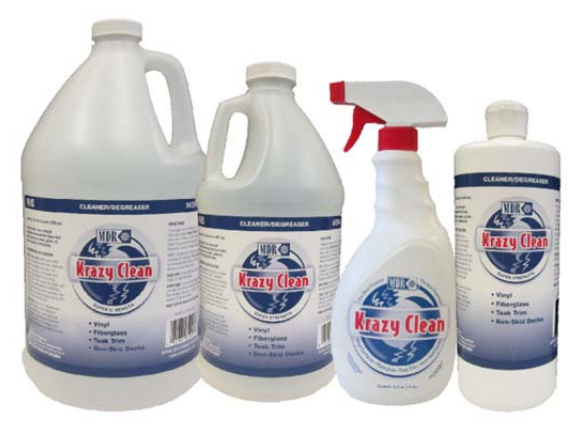 Available in five sizes, environmentally friendly, biodegradable Krazy Clean has been used by boat owners to clean almost anything on the boat. Also for home and auto. Easily cleans pool and patio furniture, vinyl upholstery, patio umbrellas, vinyl toys, handbags & luggage, fiberglass tubs and showers and even vinyl wallpaper. For auto, clean vinyl seat covers, dashboards & armrests. MDR-651 Size: 32 fl. oz. MDR-653 – Spray Size: 24 fl. oz.